Painting a home can be a large project to tackle. Maxson Painting is here to help, today we are going to cover the crucial first step of any painting project, preparation. 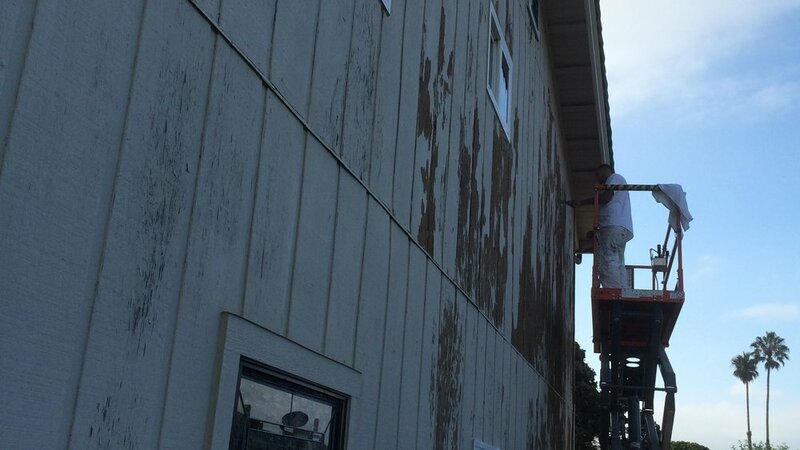 The type and amount of preparation needed before beginning your exterior paint job varies according to architecture and the condition of the substrata (the surface that you will be covering). That said, here are some basic first steps to a great exterior painting project. First pull back any dirt or plants from the base of the house to allow 2 to 3 inches for painting below ground level. Next identify any areas of mildew and treat them with a one to one solution of household bleach and water. If there is extensive mildew you may want to use a garden sprayer to apply the solution. If you choose this route be sure to keep surrounding hardscape and plants wet as a way to avoid damaging them. You will want to pressure wash the exterior of the house. A high-pressure nozzle on your hose could be used but I would strongly recommend renting a pressure washer from your local Home Depot or Lowe's. This will ensure you get a good quality washing before you start painting. Use a paint scraper, wire brush, or power sander to remove any loose and failing paint. Ensuring that all loose and failing material is removed from the substrata is critical before moving on in the project. Apply a coat of primer to all raw wood. Priming raw wood is very important even with paints that claim to be paint and primer in one. It is best to use a product designed for priming specifically as opposed to a paint that's trying to do the job of both the paint and primer. Next identify any cracks and uneven areas in the substrata and address those using elastomeric caulking and flexible patching products such as Flexall. Using flexible products is a little more difficult when patching because it shrinks and can take more than one coat. However, traditional spackle is very hard when it dries and tends to fail sooner than the flexible products. Once you have patched all the uneven areas and cracks you will need to re-sand them and prime them to ensure adhesion of top coats. Now you're ready to begin applying your finish coats of paint. In our next blog we will discuss how to select the right paints for every surface on your exterior painting project and provide tips on applying them.